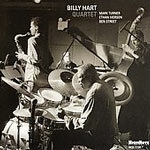 In a decades-long career that's seen him on hundreds of albums with everyone from Herbie Hancock to Pat Martino, Billy Hart has released only a handful of records as a leader. That may go some way towards explaining why he doesn't have the same cachet with the larger listening public as drummers like Jack DeJohnette. Still, when he does put out a record, it's always worth checking out. Quartet, his first release since Oceans of Time (Arabesque, 1997), may be the most unapologetically mainstream disc he's ever made, but it's never predictabledue, in no small part, to the company he keeps. 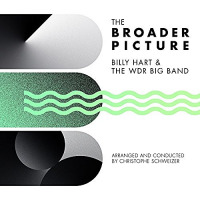 It's also the result of Hart's quartetfeaturing pianist Ethan Iverson, perennially undervalued tenor saxophonist Mark Turner, and bassist Ben Streetbeing no one-off studio construction. They've been gigging around the New York area for three years, and it shows. Iverson's "Mellow B begins with a crash of dissonance, leading into an ominous walking bass line from Street that gives Hart the first solo of the set, before Iverson and Turner deliver its spartan yet idiosyncratic theme. It's testimony to Turner and Iverson's abilities to keep things off-kilter that, while at its core it's a blues, it remains full of surprises. Even John Coltrane's famous "Moment's Notice gets a quirky reading. Iverson teases with a straightforward intro, but when Turner enters with a long, raspy low note, it's clear this group is avoiding literal interpretation. Likewise, Charlie Parker's "Confirmation appears reverential from the top, but when it opens into Turner's solo Iverson accompanies with a series of outré chords that take the song places Parker could never have envisaged. Hart's four compositions are more down-the-center, with the lyrical "Charvez and darkly serene "Lullaby for Imke standing out as the disc's most pure and beautiful moments. It's easy to imagine these and the medium tempo "Irah as strong vehicles for a Bill Evans-style approach, however Iverson steadfastly avoids any kind of romantic classicism. Despite a gentler and less blocky tack than he employs with the Bad Plus, he gives them a unique complexion. Turner, especially on "Lullaby for Imke, reaches into the upper register, sounding delicate while never losing his robust tone. "Lorca has more energy, and while its rhythmic twists and turns may be no surprise for a tune written by a drummer, its harmonic sophistication is. One look at Hart's sideman work is proof of his stylistic elasticity, but as his own body of work gradually grows, the breadth of his ability becomes even more remarkable. 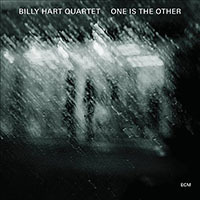 Quartet may be a mainstream record, but it's a wholly modernistic one where Hart's group approaches the middle from a decidedly left-of-center point of view. Track Listing: Mellow B; Moment's Notice; Charvez; Confirmation; Lorca; Irah; Lullaby For Imke; Iverson's Odyssey; Neon. 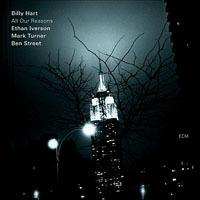 Personnel: Billy Hart: drums; Mark Turner: tenor saxophone; Ethan Iverson: piano; Ben Street: bass.